See more details about this chapbook here. Of Petals and Immortals can be purchased for $4.95 (post free) through this website. 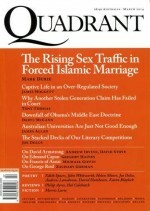 The current issue of Australian Poetry Journal (Vol. 4, No. 2, 2014) contains one of Andrew’s poems, “Dove Tanka Triptych”. safety from fears and darkness. 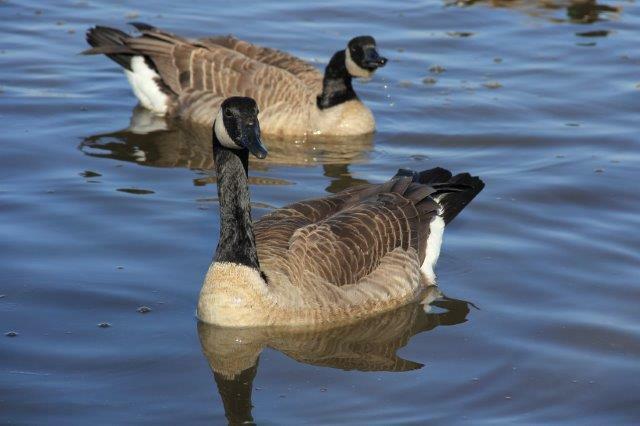 and in finding impart a form of grace. and besides it was far, far too late. he had accomplished it already? before you were feeling poorer than before. better, little brother, than even your best before. the tears and starkness, you abandoned at my door? * From the song ‘You Are the Light’ by The Innocence Mission on the albumBirds of My Neighbourhood. 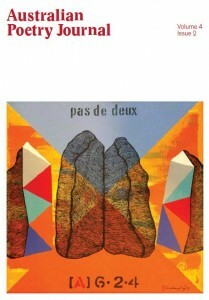 The literary journal, Meanjin, published Andrew’s poem “Departures” in its Summer 2014 (Vol. 73, No. 4) issue. “Departures” is a gunsaku consisting of 4 haiku set in Kyoto during the cherry blossom season. to set the caller’s heart quailing. and love, a voice saying my name. But she never did, being dead. 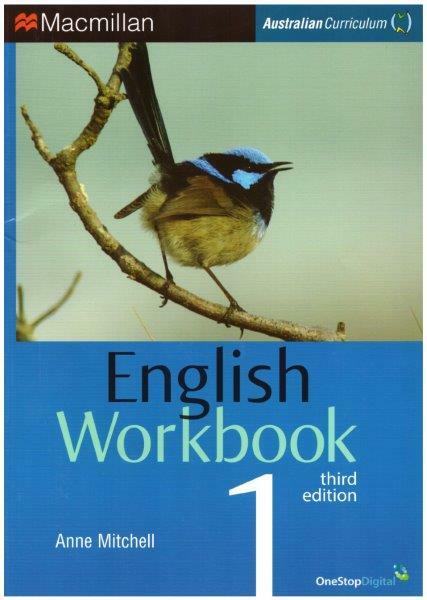 Andrew’s poem “Wren Haiku”, a gunsaku consisting of 4 haiku, has been published in English Workbook 1, written/edited by Anne Mitchell and published by MacMillan Education Australia in 2014.English Workbook 1 is an Australian Curriculum English textbook for Year 7 students. Andrew ran poetry workshops for Years 7, 8 and 9 students at Swan Christian College on 19 September. Andrew is available to run poetry and fiction workshops at primary and high schools and usually charges Australian Society of Authors’ rates. Of the 95 Australian poets who published poetry collections in the past 12 months, 17 were chosen for the ABC Radio National’s “Around the Nation” edition of Poetica that was broadcast on Saturday 13th September at 3.00 pm (and again on Thursday 18th September at 9.00 pm). 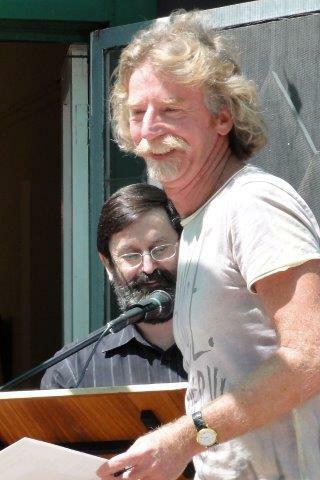 Andrew was one of those 17 poets, represented by his poem “Outhouse Haiku” from his book Inadvertent Things (Walleah Press). Perth City Library celebrated Poetry Week 2014 with a series of free events for poetry lovers in the first week of September. 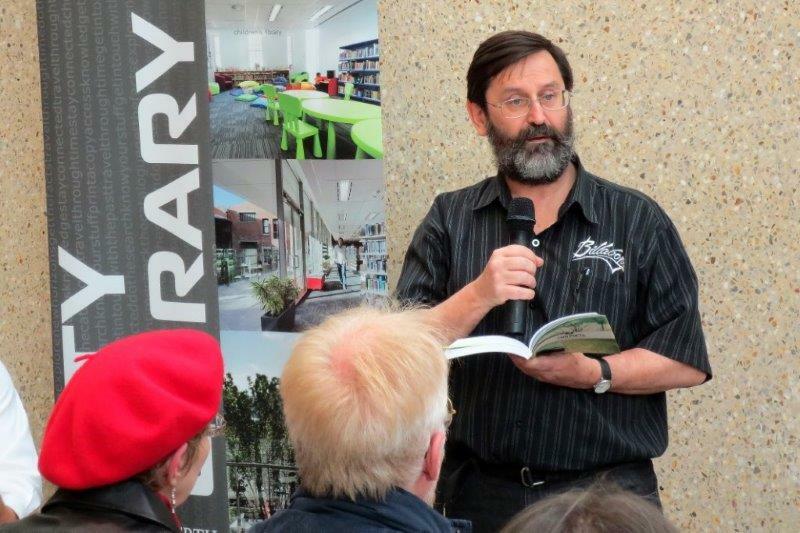 The final event was a poetry reading hosted by poet Kevin Gillam in the foyer of the City Library on Friday 5 September from 12.00 noon – 2.00 pm. Andrew was one of three poets invited to read. The other two were Anna Dunnill and Connor Weightman. Other poets in the audience read during the open mic segments. Andrew read several poems from each of his last three books, The Colour of Life (in Two Poets, Fremantle Press, 2011), Gestures of Love (Wombat Books, 2013) and Inadvertent Things (Walleah Press, 2013). Ron Nyisztor, the curator of the 2014 Mine Own Executioner art exhibition, has usedAndrew’s poem, “I Do Not Forget”, as the introductory statement in the exhibition catalogue. Mine Own Executionerhas established its reputation as WA’s pre-eminent exhibition of self-portraiture, fascinating audiences with diverse interpretations and representations of the self since the inaugural exhibition in 1995. Presented by the Mundaring Arts Centre, this exhibition has challenged over 300 of Western Australia’s most significant artists to investigate the notion of self-portraiture. Each year, the selected artists are invited by the curator to consider their approach to their visual interpretations in relation to the chosen curatorial theme. on the journey I must make? Andrew’s poetry is represented in The turnrow Anthology of Contemporary Australian Poetry, published by the University of Louisiana at Monroe in the United States. Edited by John Kinsella, the 589 page anthology contains poems from over 120 poets ranging from Jordie Albiston to Les Murray to Fay Zwicky. The two poems by Andrew in the anthology are ”Being Bamboo” and “Waterlily Haiku”. 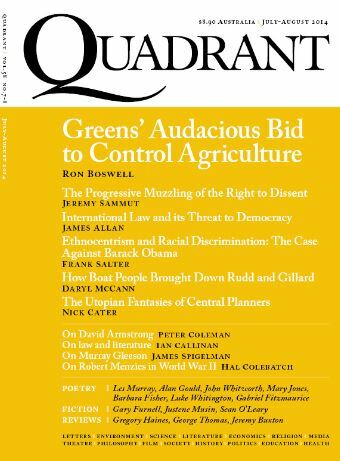 The June 2014 issue of Quadrantcontains three of Andrew’s poems, each written in the traditional Japanese form known as the tanka: “Tribute to Three Masters”, “Consecration” and “Clash”. 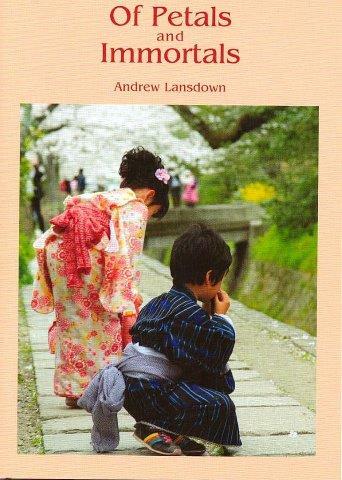 These tanka were written after Andrew and his wife, Susan, visited Japan in 2013. Catholics were turned to ghosts. 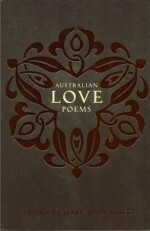 Last year Inkerman and Blunt published Australian Love Poems 2013, edited by Mark Tredinnick. The anthology proved to be very popular and the initial print run sold out within six months of its release. 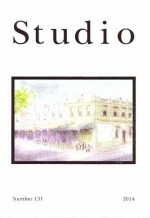 Studio journal has published five of Andrew’s poems in its 2014 autumn issue (no. 131). The poems are “South”, “Us2″, “Jizo Stones by the Three-Storeyed Pagoda”, “The Unheard Stags” and “Reading at Lunchtime”. 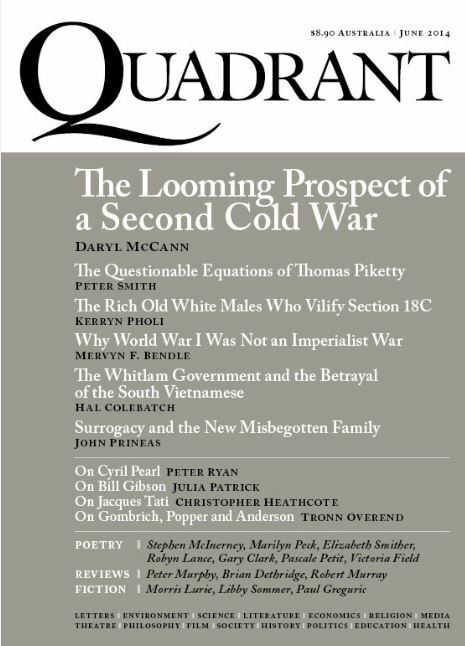 The March 2014 issue of Quadrant magazine contains five poems from Andrew: “Frog Cacophonies”, “Kyoto Blossoms”, “The Unheard Stags”, “Faces”, “Jizo Stones by the Three-Storeyed Pagoda”. With the exception of “Frog Cacophonies”, these poem were written about and after Andrew’s stay (with his wife, Susan) in Kyoto in March-April 2013. 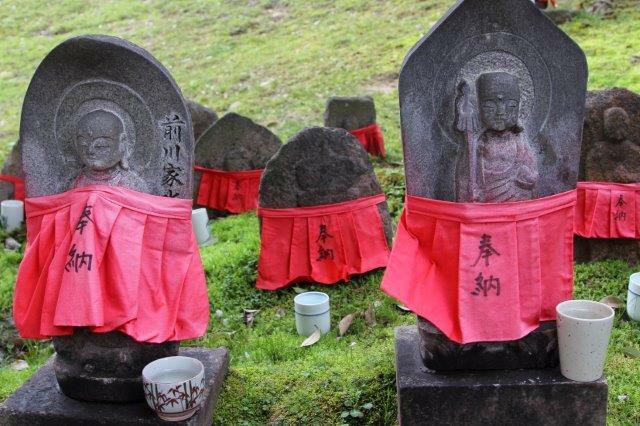 “Jizo Stones by the Three-Storeyed Pagoda” touches on the sorrow experienced by many Japanese women after abortion, sorrow they express in devotion to Jizo, a Buddhist bodhisattva who they believe will help the souls of their lost children (mizuko) to escape from the purgatory of Sai-no-Kawara. the hell they suffered here. Eight of Andrew’s poems have been included in a new bilingual anthology for children, When the Moon Is Swimming Naked: Australasian Poetry for the Chinese Youngster, edited by Kit Kelen and Mark Carthew for ASM Poetry/ Association of Stories in Macao. The poems, which are published in English and Chinese, are “Grandma and the Mouses”, “Limerick on a Long Nose”, “The Elephant Who Lost His Tail”, “A Remembrance of Robins”, “Arum Lilies”, “Mosquito Haiku”, “Stars and Moon” and “In Line”. All eight poems have been republished from Andrew’s book, Allsorts: poetry tricks and treats, and the first three can be read on this website here. ABC Radio National broadcasts a weekly program on poetry titled Poetica. 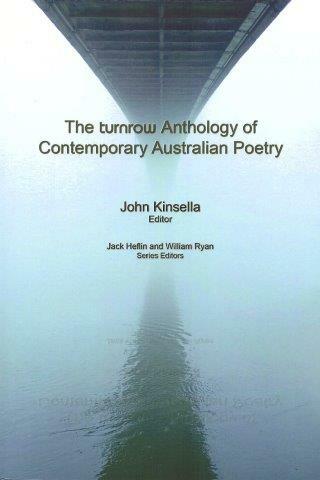 In February Poetica produced a program onNew Australian Love Poetry, drawing poems from the recently published Inkerman & Blunt anthology Australian Love Poems 2013. Andrew’s poem “Afterphase” was one of the poems chosen from the anthology for inclusion in the Poetica program. Poetica: New Australian Love Poetry was broadcast on Saturday 15 February and was repeated on Thursday 20 February 2014. The reading of Andrew’s poem begins 16.30 minutes into the program. The Katharine Susannah Prichard Writers Centre invited Andrew to judge the Karen W Treanor Poetry Awards late last year (2013) and he delivered his Judge’s Report with the announcement of the winners at a ceremony at the KSP Writers Centre in December. I wish to thank the good folk of the Katharine Susannah Prichard Writers Centre for inviting me to judge this year’s Karen W Treanor Poetry Awards. I count it an honour that the Centre has entrusted me with this task for a second time in five years. The poems submitted to this year’s Awards were wide-ranging in subject, theme, mood and setting. As one might expect concerning entries in a literary award, the entered poems varied widely in competence and quality. Yet I am pleased to say that the overall standard of the entries was good, and I commend all the poets for their work and for their willingness to have it judged according to literary standards. By way of explanation concerning my selection of the winning poems, and in the hope of helping entrants to have confidence in the judging process—and indeed, in the hope of helping people generally to see the legitimacy of literary awards such as this one—I want to make a comment here about my choice of the winning entries. It may surprise entrants to know that there isn’t much subjectivity involved in honestly judging a literary competition. There are objective standards of literary excellence against which every poem can be judged. One such universally acknowledge standard, for example, is that cliches are “bad” and have no place in “good” poetry. (Two exceptions to this standard are: firstly, humorous poetry where cliche is knowingly use to get a laugh or, secondly, narrative poetry where cliche is knowingly used to profile a person as someone who is shallow and/or conformist. But both these exceptions depend for their impact on the fact that they areexceptions to an accepted objective standard and that not only the writer but also the reader understands this.) Another universally acknowledge standard is that metaphors must involve both original and plausible comparisons—whether they are fanciful comparisons like the metaphysical conceits of John Donne or realistic comparisons like the imagist vignettes of T.E. Hulme. Poems can be objectively judged against the objective standards of literary excellence, and it is the task of the literary judge to do precisely that.